The College Farm produces over 50 types of fruits and vegetables, ranging from lettuce to potatoes, melons, and herbs. 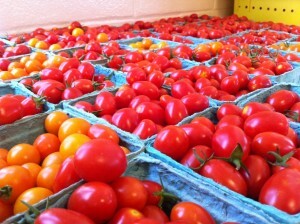 One of our main crops is tomatoes, for which there is the highest demand from Dickinson’s Dining Services. 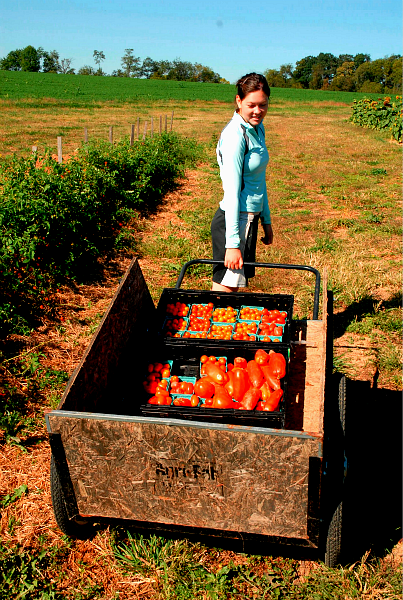 The farm cultivates as many as ten varieties of tomatoes in a season, numbering around 2,000 plants and delivering over 1,000 pounds to the dining hall each week. Throughout the season, you can also find a myriad of squash, beets, carrots, turnips, radishes, eggplant, kohlrabi, peas: the list goes on! The farm has also incorporated small fruits into its crop rotation, including strawberries, raspberries and gooseberries. Interested in learning about our eggs from pastured hens or our grass-fed and finished meat? Check out our livestock page. The farm tries its best to meet the culinary appetites of Dickinson College students, the 130+ members of our Campus Supported Agriculture subscription program, our customers at the weekly farmers’ market in downtown Carlisle, and those in need. As a USDA Certified Organic and Food Alliance Certified agricultural program, the farm does not use synthetic pesticides or herbicides. Instead, insects are controlled biologically and manually. To prevent the spread of plant diseases, the College Farm maintains a vigorous crop rotation and takes preventative measures to keep unwanted diseases at bay. 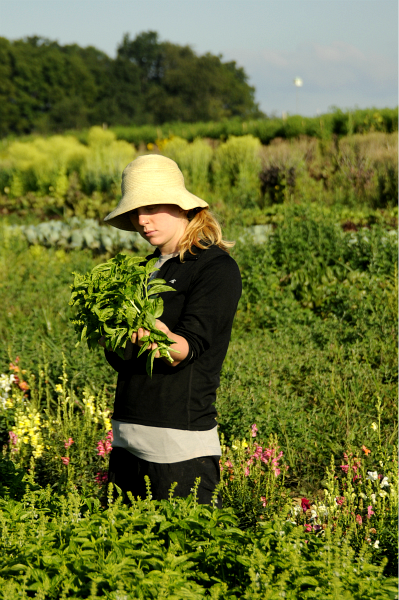 The College Farm places a strong emphasis on plant diversity. By creating a diverse agricultural landscape, we help minimize the presence of unwanted diseases and work with the resources on hand to sustain a balanced ecosystem. Likewise, hedge rows of native plants promote biodiversity while providing additional habitats for pollinators and beneficial insects such as lady bugs. In addition to sustaining these wild areas on the farm for beneficial insects, we are raising native and honey bees to encourage pollination throughout the farm and with the hopes of harvesting small amounts of honey in the future. One of the fundamental keys for crop success is the maintenance of soil health. The farm accomplishes this in two ways. The first way is through crop rotation.This is a system in which fields are in production for three years and off production for three years in a continuous cycle. Because crops have a tendency to exhaust key soil nutrients, we sow a cover crop whenever possible to replenish them. When planted together, cover crops such as cereal grains and legumes work to build soil structure and replenish necessary soil nutrients. Legumes have the ability to capture nitrogen from the atmosphere and deposit it in the soil, increasing the availability for future crops. The second way in which the farm maintains soil health is by the addition of compost, which is rich in nutrients. Compost is incorporated into the soil prior to planting, and supplements our plants with key nutrients for proper plant development.